In a rush and need something delicious and tummy filling? 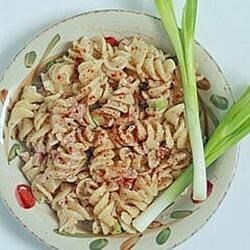 This recipe is great for working parents whose children are constantly scouring the refrigerator for food to munch on. Bring a large pot of lightly salted water to a boil. Add macaroni and cook for 8 to 10 minutes or until al dente; drain and cool under running water. Mix both cans of tuna into the cooled pasta. Add the mayonnaise. Use more or less to your taste. You want just enough to get the flavor into the salad, but not enough to see the white of the mayonnaise on the noodles. Stir in salt, pepper, garlic powder, oregano and onion.